Last week we had the chance to meet good friends at a science center on the coast. The center is small but jam packed with fun ocean activities for kids. They have a touch tank with local tidal animals, lots of tanks with some really cool ocean organisms (blue lobster!! 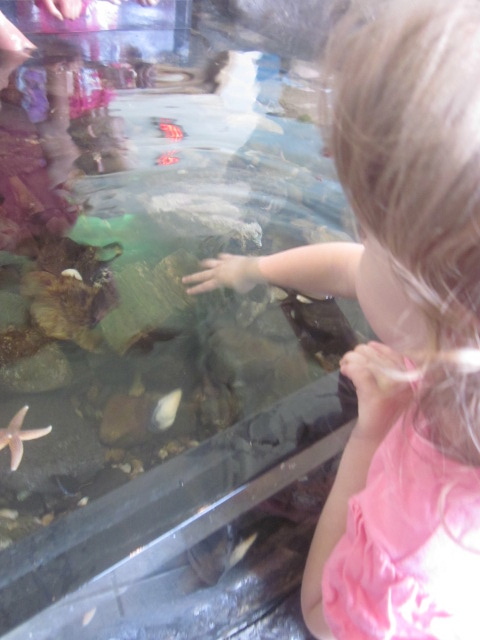 and sea horses), hands on exhibits for exploration and play and the ocean right outside the door. The kids had a ball in the center but also enjoyed time climbing and hunting around the rocky shore. On the way home we stopped at the beach. My two children spent over an hour beach combing, digging, bird watching, exploring and playing in the sand. I let them lead the way and was so amazed at their curiosity and the fun discoveries that they made. It was a wonderful day in nature, a natural world that we don’t get to see every day. Pure joy for all.